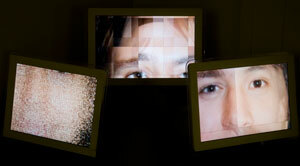 Purée is an interactive human video collage that turns people into canvases for projected video clips. The piece is a response to the work of Clovis Theilhaber, whose youtube video corpus was borrowed and process re-imagined. 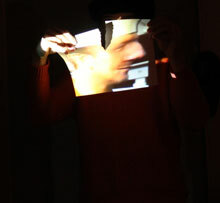 Visitors carrying sheets of paper become video clips as they move through the space, and are invited to collaborate in shaping the piece by interacting with others and tearing or joining paper. The clips are critically important to Clovis' life and work, and distant from mine. The piece imagines the body as the point of exchange, where the value of the clips gets communicated through their material incarnation on the participants. Purée is an experiment in which materiality mediates exchange. semblance is an interactive audiovisual installation that creates coherent facial composites in real-time by randomly sampling from a large database of photographs. Through a camera-mediated interaction with its viewers, the installation explores and repurposes the machinery of statistical knowledge production. By creating transient moments of liminality -- between pixel and image, objectivity and subjectivity -- semblance makes its own process visible. The work was premiered at the Yale Department of Music in the spring of 2008. The Small Figure 3 is a short piece for solo bassoon based on the Jasper Johns painting of the same name. The piece was written and performed as part of Art and Sound, a workshop with reknowned composer Alvin Lucier sponsored by the Yale University Art Gallery and IGIGI, the undergraduate composers' consortium. The Small Figure 3 was premiered at the gallery in February, 2008. 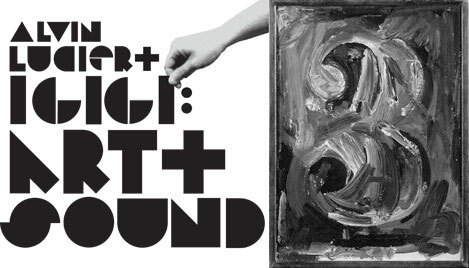 DürerBot is a fully autonomous robotic drawing and painting platform that captures, interprets, and abstractly represents its environment. 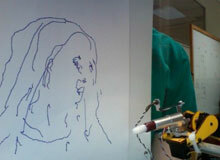 While drawing, the robot continuously records pen position and pressure to map an internal representation of its work. It is controlled by an artificial neural network, whose approximation of its dynamics encodes its drawing style, while still allowing that style to evolve with every drawing. DürerBot's representational process is always responding and evolving, raising questions of compositional agency and artistic intelligence. Digital Cubism is a video installation that merges multiple camera views into a single 3-dimensional object that can be explored in its virtual environment. The installation extends the notion of luma-keying by physically extruding images with the value of their brightness at each pixel and merging the images in the extruded space. In this way, Digital Cubism transforms multiple 2-d perspectives into a tangible volume whose meaning transcends the sum of its parts. splinter_chatter is a software-based musical performance environment that records, categorizes, and plays back short audio clips based on their content and length. 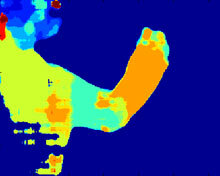 Eight tracks of audio are controlled by the performer(s) through a motion-tracking camera. Different areas of the video can be assigned to different parameters for each track, such as overall track activity (play frequency), clip type (harmonic, melodic, or rhythmic), gain, and panning. My current research as a post-graduate associate at ENALAB focuses on multi-sensor approaches to identification and localization of people indoors, geared towards assisted living and energy resource management. We seek to circumvent the challenge of correspondence in vision by fusing our camera network with other sensors, such as wearable accelerometers. By lightly instrumenting individuals with a single sensor node, we are able to label and track multiple people even as they enter and leave the field of view. 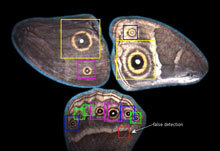 In an international collaboration between evolutionary biologist Antonia Monteiro at Yale and vision researcher Margarida Silveira at IST, we developed algorithms for feature extraction and analysis of concentric patterns (eyespots) in butterfly wings. Building on research into face detection by Viola and Jones, our system showed very promising early results with B. anynana (shown at right) while leaving the door wide open for future work with other species.